For the past decade, Audi has invested heavily in technology intended to establish itself once-and-for-all on equal terms with German heavyweights BMW and Mercedes-Benz. The company's flagship sedan, the 2005 Audi A8, suggests Audi has not only matched its primary rivals in most areas, but surpassed them in some. The A8 is Audi's largest, most sophisticated sedan: Comfortable, fast and very smooth. Yet those qualities are the baseline for full-size cars in this price range. The A8 is the newest of Germany's Big Three luxury sedans, and it raises the performance bar in many respects. It's more refined that the Mercedes S-Class, and more handsome to many than BMW's 7 Series. Nor is Audi resting on the A8's achievements. All new for model year 2004, the A8 nonetheless adds features for 2005. The line has been expanded with two new variants, including the ultra-luxurious, 12-cylinder A8 L 6.0. A8's redesign a year ago was thorough. Its wheelbase was stretched to provide even more room and comfort for rear-seat passengers, which can be crucial in this type of executive-class transport. Its 4.2-liter V8 engine was revised to generate more power, and matched to a six-speed Tiptronic automatic that allows better fuel mileage than the previous five-speed automatic. This drivetrain delivers instant response to the driver's demand for acceleration, while quattro all-wheel drive and an adaptable air suspension provide a seemingly ideal balance between handling and ride quality. Audi's unique Aluminum Space Frame, a lightweight, highly rigid structure that bonds the car into one cohesive unit, augments the supreme sense of control with Gibraltar-like stability. The A8's cabin is elegant and comfortable, and tops the class in finish quality. Audi's Multi-Media Interface, which comprises the company's attempt to integrate controls for various features and electronic systems, is easier to learn than BMW's controversial iDrive. For 2005, Audi has launched a shorter-wheelbase A8 in the United States. A standard in Europe for years, this A8 delivers all the performance and luxury for buyers who don't need such a cavernous backseat, and makes parallel parking easier. Audi also launches the elite A8 L 6.0, with its unique look, unusual W-configured 12-cylinder engine and a whopping 440 horsepower. It's the only 12-cylinder sedan from Germany's Big Three luxury brands with all-wheel drive. Finally, all A8s get two new features: Soft Touch doors, which pull the side doors shut from a partially latched position, and Automatic Key, which allows the owner to unlock the doors and start the car simply by walking up and sitting down. Better still, the new standard wheelbase A8 ($66,590) and the A8 L 4.2 ($68,500) are priced below the long-wheelbase BMW 745Li ($72,500) and standard-wheelbase 745i ($68,500), which don't offer all-wheel drive. The A8 also has a significant price edge on the rear-drive Mercedes S430 ($72,600) or S500 ($81,000) and the all-wheel-drive S430 4Matic ($75,500). The advantage holds with the 12-cylinder models as well. 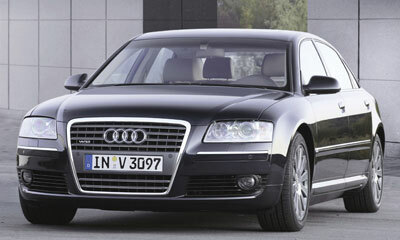 The 2005 Audi A8 is available in three variants: the A8 4.2 quattro ($66,590); the A8 L 4.2 quattro ($69,900); and the A8 L 6.0 quattro. New to the United States this model year, the A8 4.2 is known within Audi as the “normal wheelbase” car. It has all the power, technology and convenience features of the A8 L 4.2, which was introduced here in June 2003. The difference? The A8 4.2's wheelbase, and overall length, are 5.1 inches shorter than that of the A8 L (L stands for long wheelbase). Inside the car, those 5.1 inches translates entirely into a reduction in rear-seat legroom. Choose the A8 over the A8 L if squeezing into tight parking spots is more important than a vast rear seat, remembering that the standard A8's rear accommodations are still quite expansive by typical sedan standards. The 2005 A8 4.2 models are powered by a 330-horsepower 4.2-liter four-cam V8 with Audi's five-valve-per-cylinder technology. A six-speed automatic transmission with Tiptronic manual shift control is the only transmission offered, feeding power to Audi's standard quattro fulltime all-wheel-drive system. The A8 4.2s come loaded with all the luxury features you'd expect at this price point. The air-conditioning system, for example, uses temperature, moisture, and infrared sensors to detect and demist the windows before they can even think about fogging. Similar to that of the BMW 7 Series and Jaguar XJ series, the A8's parking brake is electromechanical, which in other words means a switch. Option packages for both the A8 and A8 L include a Cold Weather Package ($1,100) with heated front and rear seats, a heated steering wheel and a ski sack; and a Convenience Package ($2,000) with Advanced Key, electric rear sunshade, manual side sunshades, and power trunk open/close. New standalone options for 2005 include: adaptive cruise control ($2,100); choice of XM or Sirius Satellite Radio ($550 plus installation); and three-spoke multifunction wood steering wheel ($480). Additional options: solar sunroof panel ($650); front and rear Parktronic park-assist ($700); power door-close assist ($450); and front seat massage and ventilation ($1,500). There's a choice of 18-inch five-spoke cast alloy wheels with all-season tires ($1,150) 18-inch nine-spoke cast alloy wheels with all-season tires ($1,700), or 19-inch 12-spoke cast alloy wheels with performance tires ($1,900). The A8 L 6.0 offers three options: a 20-inch wheel/performance tire package, upgraded from standard 19-inch wheels and not offered by BMW or Mercedes; radar-managed Adaptive Cruise Control, which maintains a prescribed distance to traffic ahead; and a rear-seat entertainment package with DVD player and two LCD screens in the back of the front headrests. The rear center console can be deleted in favor of a three-place bench seat. Elegant. That's how we'd describe the A8 in a word, but elegant in a forceful fashion that's not at all prissy. The A8's distinct wedge shape features a short front overhang, a low hood-line and a high, powerful tail. The shoulder line rises to the rear, creating the impression of a crouched beast ready to spring. The A8 is expressive in an understated Audi way and people will know you know business when you fill their mirrors. The front end of the A8 4.2 sports Audi's traditional dual horizontal grilles with flush-fitted headlamps. Projector-beam fog lights sit below the well-integrated front bumper. Nearly 17 feet in length, the A8 L is longer than the Mercedes S-Class and long-wheelbase BMW 7 Series models. Its wheelbase stretches 121.1 inches (116 inches on the standard A8), essentially identical to its European competitors and substantially longer than that of the Cadillac DeVille. Other things equal, a longer wheelbase offers more passenger room and increased stability at speed. The Audi is slightly wider than the Mercedes and comparable to the BMW. Its rear doors are long, allowing easy access to the rear seat. All the doors open extra wide, making it easier to get in and out. The flush, lever-style outside handles are attractive, but we find them harder to use than the type you can put your hand through, such as those on a Mercedes. The A8 4.2s feature seven-spoke 17-inch alloy wheels with 255/55R17 tires; these provide excellent handling and ride comfort and superb grip in the wet. The optional 18- and 19-inch wheels and tires more aggressively fill the wheel wells and provide a surprisingly smooth ride in spite of their short sidewalls. The 12-cylinder A8 L 6.0 gets the 19-inch wheel/tire package standard (20-inch wheels are optional). The 6.0 features a tall, vertical grille the company calls “the new formal idiom of Audi design.” The new grille connects Audi's familiar horizontally split grilles over the front bumper, emphasized with a chrome surround and chrome horizontal slats. It's similar in design to the grille on the all-new 2005 Audi A6. The 4.2 models feature Audi's traditional split grille. The A8 L is the first car with LED headlights. Its low beams consist of five light-emitting diodes developed jointly with a California-based company. Audi says these lights draw considerably less current than halogen or xenon bulbs to deliver an equal amount of light. Less current draw means that the alternator, which generates a car's electricity, doesn't have to work as hard, and therefore robs less power from the engine. The A8 L 6.0 is the first car with daytime running lights that have virtually no impact on fuel economy, and full low-beam operation requires far less alternator draw than conventional lights. The rear of the A8 models feature taillights that fit flush with the clean rear design. Turn signals use LED technology and feature side repeater lamps to signal your intentions to drivers alongside. Dual exhaust pokes from below the beautifully integrated rear bumper. Audi also says the A8's aluminum space frame (ASF) saves about 300 pounds compared to a conventional steel frame, allowing more features without overburdening the car with weight. Still, an A8 L 4.2 weighs more than a BMW 745Li and more than an all-wheel-drive Mercedes S430 4Matic, both of which have more conventional steel-intensive construction. But the ASF offers other advantages. It uses fewer parts with fewer joints for increased rigidity. Increased rigidity means less flex, and the A8 feels as if it's milled from a single block of bar-stock aluminum. That improves just about everything else in the car, from ride quality to handling to overall smoothness. All A8 variants come loaded with features, and each model is comfortable and luxurious. Interior design is clean and classic, but hardly spartan or stark. A choice of leather and three wood trims ensures a touch of individuality. Handsome Valcona leather seat upholstery comes standard, with attractive Alcantara (suede-like) door inserts. In the A8 L 6.0, virtually every surface that isn't carpeted is covered with leather, save the top of the dash and headliner, which is made of Alcantara. There's also a swath of aluminum around the dash and doors. The mix of wood and metal may sound like design schizophrenia, but it actually adds a sporting flair. In total, the A8 cabin is handsome and remarkably rich in appearance. The seats are supportive and comfortable and adjust 16 ways. A memory feature keeps all the settings for four different drivers (or moods), including climate controls. Front and rear seats can be heated and ventilated. The center console provides generous storage, and the electroluminescent instrument panel adjusts brightness automatically according to ambient light. The A8 L 6.0 gets a unique, four-spoke wood steering wheel with a hub fashioned to replicate the shape of the grille. A seven-inch color screen in the top-center of the dash displays Audi's Multi-Media Interface, or MMI. Four buttons and a dial on the center console do the adjusting. This system is designed to minimize distraction while consolidating most of the interior functions into one control center, giving the driver lots of options without filling the dash with buttons. Unlike the iDrive system BMW developed for its 7 Series sedans, Audi's MMI features a shallower menu structure, meaning you don't have to burrow as deeply through a maze of menus to get to the adjustment you want. A key difference between the Audi and BMW systems, in our opinion, is that Audi did not incorporate the climate controls into MMI. Heating and air conditioning have traditional controls mounted high on the center stack, so you don't have to call up a menu to change the fan speed. You simply twist a dial. The MMI screen matches the look of the controls, and a Return button takes you back to where you were, like the Back button on a Web browser. Virtually everyone we've spoken too, from auto reviewers to consumers, rates Audi's MMI better than BMW's iDrive. But some rate the Audi system only minutely better, and don't like it much at all. Others prefer Mercedes' more conventional button-heavy interface. Or, easiest of all, Jaguar's elegant and traditional controls. The point? Designing controls to manage the ever-increasing number of performance, entertainment and communications systems in luxury cars traveling at high speeds remains a young, inexact science. BMW's and Audi's take effort and practice to learn. At times, we found the technology overwhelming, like when the radio came on every time we started the car. Try to familiarize yourself before you buy. Beyond finish quality, attention to detail is one of Audi's greatest assets. A secondary heater in the A8 is designed to heat up the rear cabin quickly. Ambient lighting in the interior allows control of mood in the cabin. Mood lighting is good. In luxury sedans, so is quiet. The A8's cabin is well insulated (the 12-cylinder 6.0 features double-pane side glass), and conversation is easy at any speed, even in the nosiest ambient conditions. There's no wind noise in this car and the ventilation system was acoustically tuned to make the climate control as quiet as possible, even when the fan is at full blast. The audio system uses Bose noise compensation technology just like those fancy headphones you see people wearing in first class. It works terrifically well. Essentially, a microphone samples the sound and sends out sound waves to cancel out undesirable noise. The 12-speaker stereo sounds fantastic, with crisp bass and clear highs. In the 2005 Audi A8, a driver can use the Driver Information Display to set the optional Adaptive Cruise Control, which minds tailgating and maintains a safe, pre-determined distance to the car ahead. The Electronic Stabilization Program can help control the car when the driver can't. Electronic Brake-force Distribution keeps the car balanced in a panic stop, and Brake Assist slams the binders harder if the driver doesn't press as hard he or she should. Adaptive Air Suspension keeps the ride smooth and tires planted no matter the surface. There are moisture-sensing wipers, high-intensity headlamps and ten airbags. Yet all these advanced systems, identified by a confusing array of acronyms, don't mask one crucial point. The A8 can be a complete joy to drive, reminding all but the sensory deprived how pleasant gobbling miles in a big, fast luxury sedan can be. The first impression at the wheel of an A8 is its smoothness. There's nothing remotely resembling a squeak or rattle, and almost no vibration in the cabin. The A8 can be a thrill to drive. The 4.2-liter V8 delivers powerful acceleration, but its power delivery is sophisticated, not crude. The engine was revised for 2004, and it delivers more power than its predecessor. Both the short- and long- wheelbase A8 4.2s can sprint from 0 to 60 mph in just 6.3 seconds, according to Audi, impressive given their size and weight. Top speed is electronically governed at 130 mph. The V8 responds with a muted roar to every poke at the gas pedal. No matter how fast the A8 4.2 is already going, the driver can tap into a deep well of acceleration-producing torque. And if that isn't enough, you can raise the ante with a 6.0-liter 12-cylinder engine. New for 2005, the A8 L 6.0 gets Audi's unusual W12, which is actually two single-cylinder-head VR6 engines, splayed like two Vs and mated at the crankshaft. Each bank has its own computer controls and throttle. Other things equal, is this W design more powerful or economical that a conventional V12? Not really. Torque and horsepower are comparable to the 6.0-liter V12 in BMW's 760Li. The 6.0-liter V12 in the Mercedes S600, with its twin turbochargers, is substantially more powerful than either the Audi or BMW engines. The advantage of the W12 lies in the packaging. Despite its extra cylinders, it is no bigger than the typical V8 with less displacement. Indeed, Audi's W12 is actually a bit smaller by overall dimensions than the smaller-displacement V8 in the A8 4.2. The W12 therefore allows Audi to build a 12-cylinder sedan with all-wheel drive. With a conventional V12, there would simply be no space in the engine bay for a differential and other components required to power the front wheels, according to Audi. Regardless of the packaging advantages, the A8 L 6.0 is a blast to gas. Throttle response is immediate, and it delivers acceleration-producing torque in a wide, flexible band befitting a luxury carmaker's flagship sedan. The W12 pulls hard up to its 6200-rpm redline, and it feels like there's still more power coming when it hits the rev limiter. Moreover, the revs translate to executive-class thrust. Audi reports 0-60 mph times of 5.0 seconds, with top speed governed at 155. With either engine, the A8's six-speed automatic shifts up or down according to the driver's wishes, deftly sensing how quickly and how hard the throttle is mashed. Upshifts are silky smooth in full automatic mode; in some instances, downshifts could come quicker, but the reserve of torque in either engine more than compensates for any shift lag. This transmission is an improvement in every respect over the A8's previous five-speed automatic. It helps the A8 achieve better fuel economy with the improved acceleration, and V8-powered variants are no longer saddled with a federal Gas Guzzler Tax. With each new model introduction, Audi further dispels any lingering perception that it's not a Tier 1 premium brand on par Mercedes and BMW. Like the Mercedes S-Class and the BMW 7 Series, the Audi A8 is fast, roomy, luxurious and exceptionally comfortable. It rides like a luxury car, yet it's taut and handles like a sports sedan should you decide to drive it more aggressively. Loaded with innovation, the A8 is a thinking man's luxury sedan, more progressive, less traditional than a BMW or Mercedes. It's elegant but not arrogant, indulgent without being excessive. It's priced a little lower than comparable sedans from BMW and Mercedes-Benz, yet gives up almost nothing to either. V8 or 12-cylinder? In Germany, where the autobahn beckons with no speed limit, that would be an easier choice, assuming money is no object. In our land, the 12-cylinder's advantage is image as much as it is functional. The $45,000 price premium compared to the V8 makes for expensive image, no matter how much disposable income you have. Nonetheless, if you want a 12-cylinder sedan with all-wheel drive, you can't choose an S-Class or 7 Series, because neither Mercedes nor BMW offers one. And even if they did, the A8 L 6.0 quattro would be an excellent choice. Head/hip/leg room, f: 37.4/NA/41.3 in. Head/hip/leg room, r: 38.3/NA/42.3 in. Cargo volume: 17.7 cu. ft.